Wading into the warm, quiet waters of Monmouth public swimming pool on Sunday, I am mentally prepared to drift about for an hour playing whichever lazy games take the fancy of my nine-year-old daughter Laura. We’ve been taking her swimming since she was tiny and she has developed into a real water baby. With the encouragement of my husband, who is a much more enthusiastic swimmer than me, (I think he may have been a merman in a previous life), Laura quickly graduated from a floating baby seat to inflatable armbands to being a free swimmer. However, we’ve never signed her up for swimming lessons, unlike many of her friends, who are called up regularly in Friday celebration assembly to collect swimming certificates for ever-greater distances. She’s never wanted lessons either, preferring to mess about and play games, in between short bursts of very competent swimming, much of it completely underwater. Our only concern about her performance in the pool is that we sometimes wonder whether she’s ever going to come up for air. The child has the lungs of a seal. Laura’s games in the pool have of course changed over the years, from having me drift about the pool with her in my arms singing songs about water babies, to having to impersonate tug boats when she was about 4 and obsessed with a video called Tugs (a sort of floating Thomas the Tank Engine), to pretending we’re various sea creatures. I’ve had the occasional twinge of guilt at not making her take swimming lessons, but at the same time we’ve not wanted to spoil the sheer pleasure she has in being in the water. When she was about two, we spent hours on a beach in Greece watching her repeatedly climb on to a small rock and jump off into the water, with as much concentration as if she were trying to mentally calculate the volume of the water she was displacing, like Archimedes in his bath. Laura wonders how they ever manage to go to the toilet if they turn into mermaids every time they’re in contact with water. 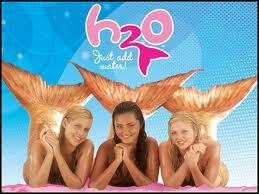 Not surprisingly, her current favourite television viewing is an Australian teenage series called H20: Just Add Water. This is all about three mermaids -0r rather, teenage girls who, after a trip to an enchanted island, discover they turn into mermaids every time they come into contact with water. So in Monmouth I’m fully expecting that we’ll have to play H20. 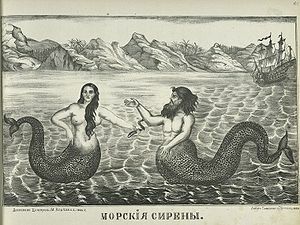 I’m just wondering how to persuade my husband to be one of the mermaids when she takes me completely by surprise. “Come on, let’s have a race!” she cries, and immediately starts to swim with great concentration towards the deep end. I follow, feeling slightly put out. Usually I’m begging for time off from her watery games to do some actual swimming, but I hadn’t anticipated being made to race. She beats me easily to the far end of the pool. Then she spots the clock above the pool with its big red second hand ticking round. This happens several times before we revert to our usual improvised games with woggles (you know, those great long bendy sponge sticks), and it’s not long before every child in the pool is trying to do the same as her. She is very inventive with them. I’m left wondering what has brought on her sudden need for speed. Previously, I’d have said Laura doesn’t have a competitive bone in her body. While many children can easily be chivvied into doing things faster – dressing, eating meals, bathing – by turning the activity into a race, Laura has always resisted. In fact, trying to make her race usually only slows her down, as she resists any attempt to hurry her, no matter how subtle. 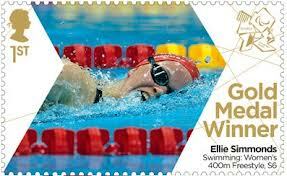 Did they put silver medallists on second class stamps, I wonder? I can only blame – or rather, thank – the London 2012 Olympics. We spent a long time glued to the aquatic events this summer, especially those involving the wonderful Ellie Simmonds, whom Laura really admires. Perhaps it is this that has transformed Laura’s take on clock-watching from something irritating that Mummy does in the mornings to something really valuable that wins gold medals for her heroes. I am delighted. Either that, it might be the superpower that the H20 mermaids have – they can swim as fast as speedboats when they’re in a hurry. Either way it’s – dare I say it? – a sea-change in Laura’s attitude. Their magic is catching. It’s not just in the swimming pool that Laura’s got her eye on the clock. Voluntarily, she’s dug out her watch, which I suspect had been strategically hidden some time ago, and she has started wearing it every day, even in her sleep. She’s timing herself on other activities too. I dare not intervene for fear of breaking the spell. I guess it’s another milestone in her growing up, taking responsibility for her own time management, and I am truly grateful. All the same, I hope our days of playing mermaids will not be over any time soon. Unlike Laura, I was not a sporty child. This post compares our experiences of school sport: Keeping Up With My Sporty Daughter. Such a lovely post, Debbie. Have you ever thought about compiling these into a book for Laura for later in life? That’s a lovely thought, Laura – thank you! 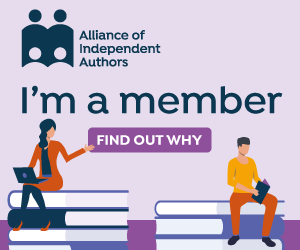 I haven’t really thought about that – I don’t even print off each new blog post, just assuming the ether will keep it safe, which is probably a bit rash. Your suggestion will prompt me to do that, at least, now! Thank you! You’re welcome. There are many options, really. You could make an e-book or a scrapbook kind of thing or do a cerlox binding… wherever your creativity leads you!